Carrie Lam said she was answering God's call when she decided to run for Hong Kong's top political job as chief executive. She has also spoken of her conviction that there would a place reserved for her in heaven. Yet Ms. Lam, a Roman Catholic who will become Hong Kong’s next top political leader in less than two months, also has an earthly master—the People’s Republic of China. Ms. Lam—the city’s former number two official—was not elected by ordinary voters. She was chosen by a 1,194-member election committee dominated by Beijing loyalists in a process dubbed “small-circle election” that has been in place since the 1997 handover of sovereignty from Great Britain to China. Before the vote in late March, Beijing made clear that Ms. Lam was its preferred candidate and she won with 777 votes, beating former finance chief John Tsang, another Catholic who enjoyed public popularity but is said to have lacked the Chinese government's support. He received only 365 votes, even though he had led opinion polls carried out by three local universities since the beginning of the year right up to the election. The following month, Ms. Lam flew to Beijing to accept her appointment by Chinese leaders. On July 1, she will start her five-year term leading Hong Kong. The territory is part of China, but under the handover agreement negotiated with Great Britain it maintains a degree of autonomy from Beijing. The political mandate for Hong Kong's chief executive comes from China, and Ms. Lam has a record of pushing policies favored by Beijing. As a result, many fellow Christians in Hong Kong are uncertain about her willingness to uphold her faith while serving communist bosses in Beijing. 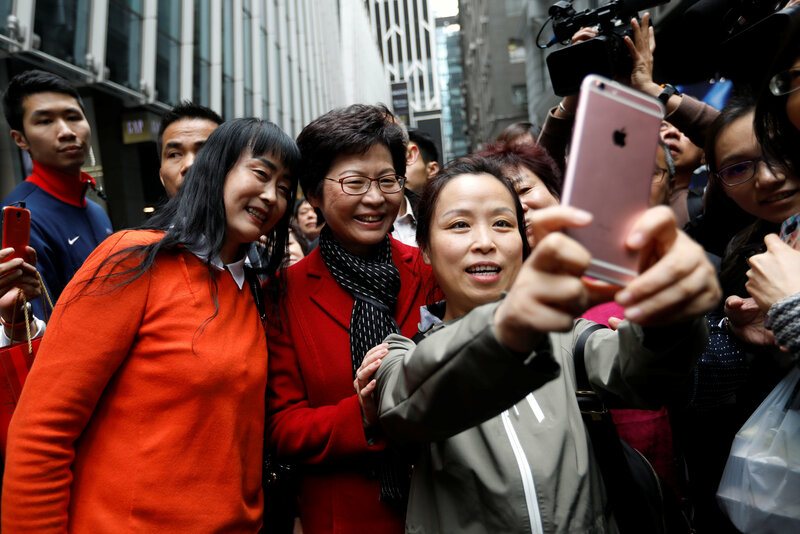 Carrie Lam said she was answering God's call when she decided to run for Hong Kong's top political job, but she also has an earthly master—the People’s Republic of China. Ms. Lam's office declined to answer a reporter's emailed questions on issues raised in this article, explaining she did not have time. Ms. Lam's political loyalty gained her the trust of the Chinese government, but it cost her popularity among ordinary people in Hong Kong. According to a rolling opinion poll carried out by the University of Hong Kong, her support dropped 10 percentage points from 61.1 in the first half of 2014 to 51.1 in the same period of 2017. She had led a Beijing-backed government task force on political reform in Hong Kong in 2014. The reform proposal, based on a ruling by China's National People's Congress Standing Committee in August 2014 but pushed by Ms. Lam, would have enabled ordinary people to elect Hong Kong’s chief executive but only from a list of candidates vetted and pre-approved by a 1,200-member nominating committee. Pro-democracy politicians and activists decried it as “fake democracy,” and their anger triggered the 79-day "Occupy Central" protests, also known as “the Umbrella Movement.” The reform proposal was voted down by lawmakers in 2015. Many Christians are skeptical of Ms. Lam’s ability to defend religious freedom in Hong Kong. She is partly at fault for that skepticism. While campaigning to become Hong Kong’s chief executive earlier this year, Ms. Lam proposed setting up a new “religious affairs unit” to coordinate religious policies in Hong Kong. Catholic and Protestant groups strongly objected, fearing such an oversight group could function like mainland China’s religious affairs bureau, which monitors, controls and cracks down on religious activities not sanctioned by the state. Cardinal John Tong, the bishop of Hong Kong, wrote to Ms. Lam in March, expressing the diocese’s “resolute opposition” to the establishment of the unit. The diocese warned in a statement that mainland China “is led by an atheist and communist government” and that religious affairs units on the mainland are used to gather information on religious groups, urging Ms. Lam to abandon the idea. A joint petition with more than 600 signatures from mostly Catholics and Protestants also asked Ms. Lam to scrap the proposal and to ensure that religious freedom in the territory would be free from government interference. She backed down in the end, but the incident left the impression that she was someone eager to push for policies that pleased Beijing even at the expense of religious freedom in Hong Kong, several Christians and scholars said. Many Hong Kong Catholics took to social media to air their displeasure over Ms. Lam's remarks on her faith, ridiculing her claims that she has a place in heaven because she was “persecuted for righteousness’ sake” in her previous work and urging her to demonstrate more humility. Professor Ying Fuk Tsang, an expert on Christianity in China at the Chinese University of Hong Kong, said Ms. Lam’s remarks were inappropriate attempts to use her faith for political cover. He said her endorsement of a religious affairs unit shows a lack of foresight on religious freedom issues. Mr. Ying pointed out that since Hong Kong’s leaders, handpicked by Beijing, are not accountable to voters but to the Chinese leadership, meeting their Beijing bosses' demands are often their main priority. Mr. Ying said that "if living out your religious faith involved criticism of dictatorships, defense of individual thinking and an insistence on faith and integrity, then there is bound to be conflict” between faith and the role of chief executive of Hong Kong. Both Mr. Ying and another academic at a Catholic seminary who asked to remain anonymous pointed out that a leader’s faith is no guarantee of their good conduct in any case. Donald Tsang, Hong Kong’s chief executive between 2005 and 2012, a devout Catholic, was sentenced earlier this year to 20 months in jail for misconduct in public office. When his cabinet was considering a broadcasting license application from a Hong Kong property developer, he had neglected to mention that the business executive was also his landlord. Rafael Hui, the city's former number two official, also a Catholic, received a sentence of seven and a half years in 2014 after being convicted of bribe-taking from a property tycoon. Sister Beatrice Leung, a research professor at Wenzao Ursuline University of Languages in Taiwan, said while she respected Ms. Lam’s belief that she was called by God to lead Hong Kong, she has seen little evidence of that Ms. Lam's Catholicism made much difference in her previous government roles. “We understand that the political development of Hong Kong is in the hands of Beijing. Political consideration from Beijing would be the main theme of Lam's policy,” she said. Sister Leung said it was too early to judge if Ms. Lam will act in accordance with church teaching in her new role, but she is likely to be tested at some point. Sister Leung used the example of St. Thomas More, lord chancellor under King Henry VIII, who famously said, "I die the King's good servant, but God's first," before his execution, resisting the king’s power in defense of the church.